The new ASUS Zenbook UX301LA-DH71T is surely an amazing top of the range notebook. It is stunning looking, runs fast, extremely powerful, has a great build quality, but pricey. 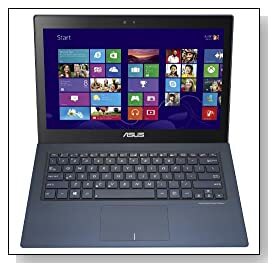 It has a Haswell Intel i7-4558U dual core processor that takes advantage of hyperthreading by letting dual cores tackle 4 threads in parallel. The speed goes from 2.8 GHz to 3.3 GHz thanks to Turbo Boost. You will find 2 x 128 GB solid SSDs- Raid 0 as storage, which helps keep your files secure, also it can make your laptop run extremely quick. 8 GB DDR3L SDRAM brings you the best of multi-tasking. Windows 8 operating system is great to use on touchscreen and can be upgraded for free on the online Microsoft store. It has a backlit keyboard for you to be able to type comfortably in dim-light or dark and the backlighting features three brightness options. The 13.3 inch touchscreen is a widescreen quad HD display with impressive 2560 x 1440 image resolution. It has the IPS function that enables for 178 degree viewing angle and is glare-free. The display is impressive with the most vivid images in the market and an outstanding 320:1 contrast at maximum brightness (can go up to 390:1). Sound quality is fantastic especially for an ultrabook. It is up to you if you'd like to get additional audio speakers or headphones however the built-in speakers are sufficient. Even though the UX301L is a part of the Zenbook range, it is visually a different model when compared with earlier Zenbooks. It is a dark blue with a metallic finish lid and glass covered for an additional amount of beauty. Its attractive style makes an excellent first impression and draws in lots of attention. It is small, sleek, lightweight and mobile at 2.6 lbs weight and 0.6” thickness. The battery lasts as much as 8 hours in regular usage, so you're able to take it along with you and use it throughout the day. This ultrabook includes 2 x USB 3.0 ports for up to ten times faster data transfers and has Bluetooth to wirelessly link to other devices. A mini-HDMI out, a media card reader, a headphone/microphone jack, VGA and Ethernet ports are also what you will find on this ultra slim notebook. 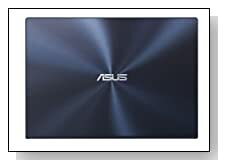 Conclusion: Equipped by the 4th generation Intel i7 processor, 8GB memory and a 256 GB of solid state drive, the stylish, sleek and lightweight ASUS Zenbook UX301LA-DH71T is a brilliant premium quality powerhouse of an ultrabook with vivid 2560x1440 pixel resolution screen and Sonic Master audio system. If you can afford it and are disappointed with how other ultrabooks have to give up on features or something in some way, this really is an outstanding notebook.